When we bought our house 23 years ago, there was something I loved about it and something I hated. The kitchen! 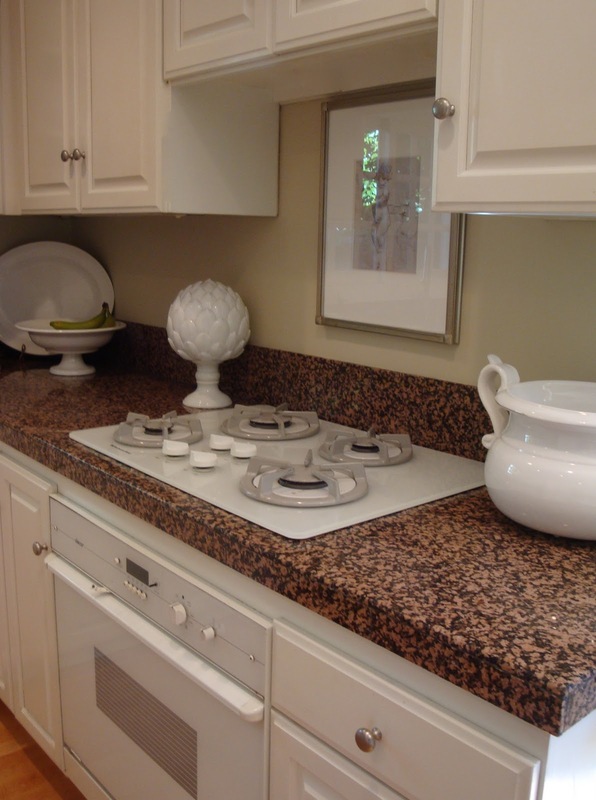 I loved that the kitchen was so bad because I knew that I would have to get to re-do it! It had a bright yellow (I mean Pluto-the-dog-yellow) linoleum floor that curved up onto the walls. I had no intention of ever keeping the floor so while I was taking art classes I used the floor as a perfect cutting board for my X-Acto knife. I guess there was some misunderstanding because my husband was not in the same hurry to replace that floor or the kitchen. So it stayed for a number of years, cuts and all. Until one day a client of his came over and told him that our house was beautiful except for the kitchen. He said that the kitchen did not seem to go with the rest of the house. And that was the day we started planning the new kitchen. That was over 20 years ago. 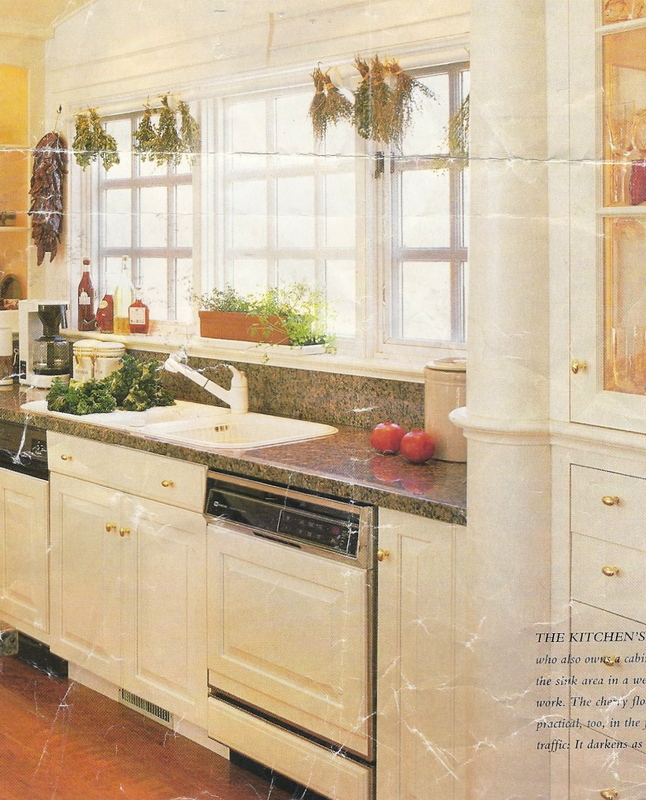 The kitchen is still 'okay' even after 20 years. I still like the layout and I love the floor (a solid maple "gymnasium" floor!). The cabinets have held up well and other than minor touch-ups it has not been re-painted in 20 years and it is still hanging in there. I would definitely like to make some changes (my biggest complaint is the countertop) but all in all it is not too bad. Three out of the five appliances have died and have had to be replaced. When the cooktop and oven go, I will be forced to replace the countertop. I used to hope the oven would go so that I would 'have to' get a new countertop, but now I am hoping it will survive long enough for our financial situation to recover! I am lighting the burners with a match because they don't make the part I need anymore so I know I am on borrowed time. This backsplash is all wrong! The microwave that was mounted above the cooktop died first. I choose not to replace it because am holding out for a future hood. I bought a small countertop microwave and put it in the pantry area and did a quick patch and paint job and covered it all with a framed print (hung too high to hide what is behind it). 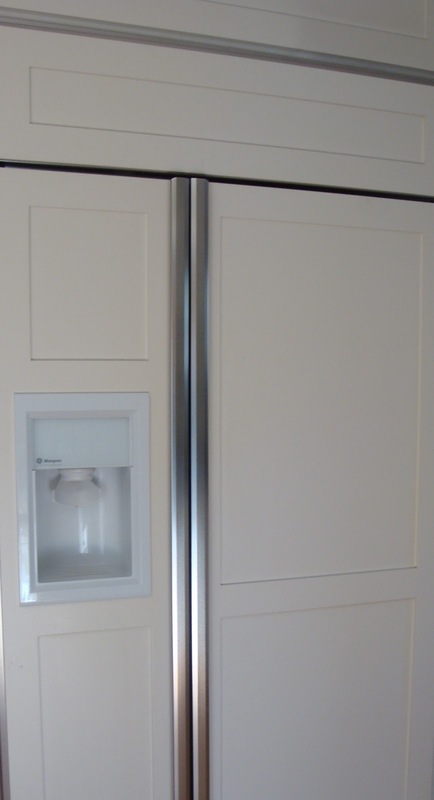 Then when the built-in refrigerator and dishwasher went out I had to make a decision. Do I match the cabinetry that I don't like anymore or do I put in what I hope to have eventually. I opted for the latter. And other then the fact that the paint colors are all different shades of white (the ceiling is freshly painted, the 20 year old cabinets have yellowed and the new refrigerator and dishwasher door fronts were painted oil base and came out too dark) it is not too bad. In person it is less obvious and I can live with it. What would I change if I could? I would change the cabinet doors to a more simple style (like the new refrigerator and dishwasher panels). 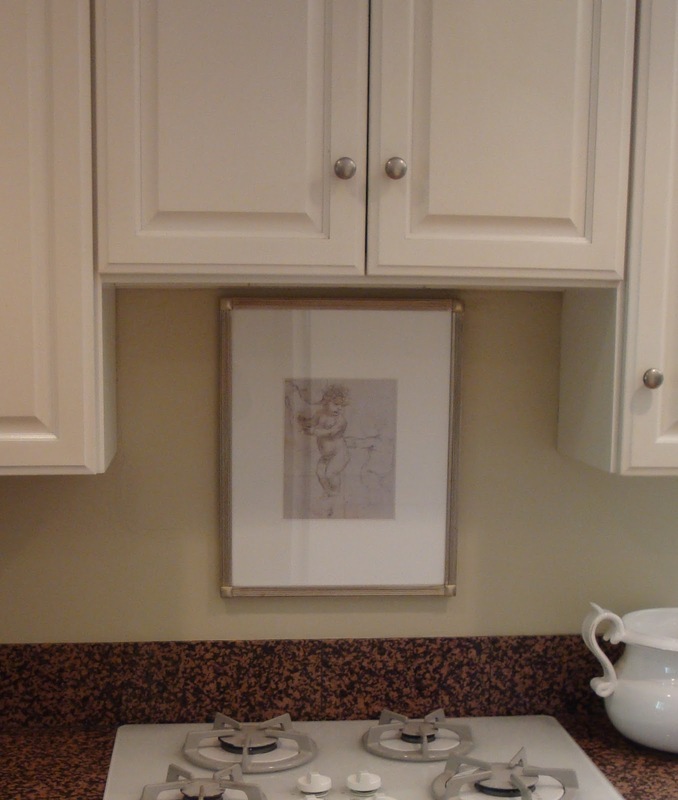 I would eliminate the arch on top of the cabinets and take out the cabinets above the window. I would replace the window for one that was cleaner and not so busy. 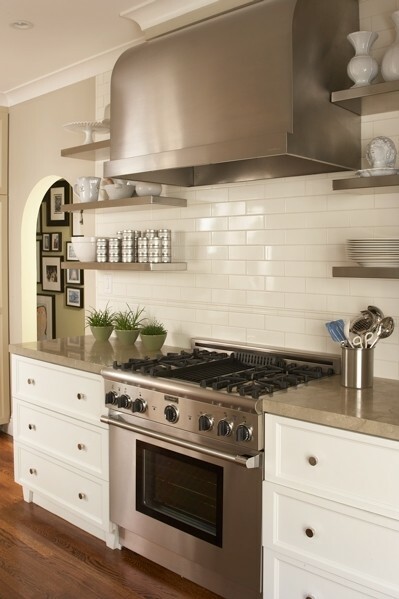 I would put in a simple white subway backsplash and a solid counter - those 12 x 12's have to go! And I want a commercial looking stove with a nice hood above it. Hey Sherri, that's lovely. Guess what? After years of having english country kitchens or basic rental yuck I'm now doing up our new home AND found I've become attracted to white kitchens American-style:) I think I must have caught some kind of minimalist bug lol! I'll be writing a post like this one day soon I think. I have a kitchen that is too small and crowded so I need to do a minor remodel, but it also has maple cabs that are perfectly fine, but I am a white cabinet girl. 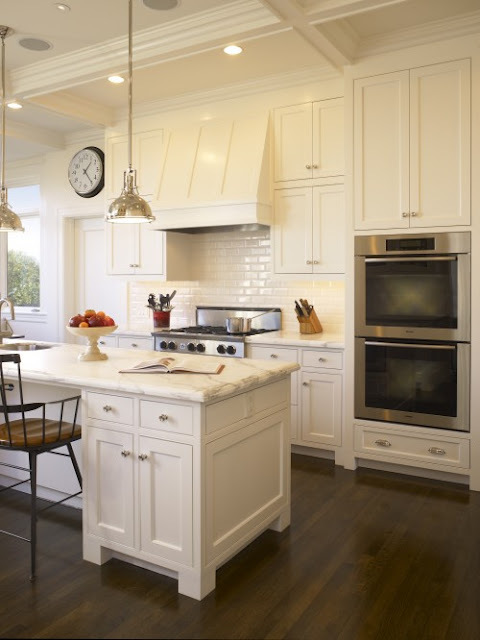 I saw Martha Stewarts white cabinets in the style you have at Home Depot. She has new line and it is quite nice. I see how wrinkled your original inspiration pic is and it makes me laugh. I have ancient mag pics too that get carried around for years. I love the new inspiration! yours has held up surprisingly well for 20 years! 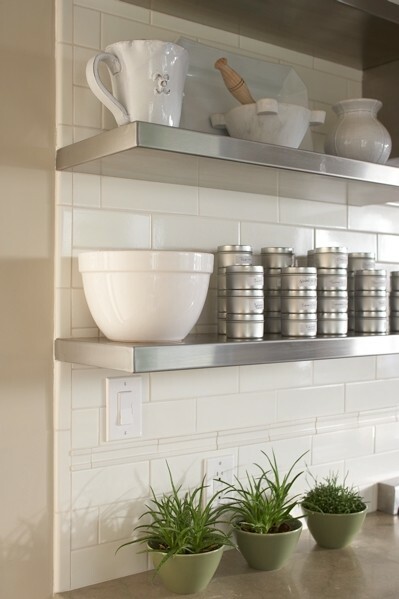 and I am with you on the back splash - I eventually want white subway tile....love it. I think you can! And I would have done the same thing with the refrigerator! PS - I have, and LOVE, that artichoke. Oh, I thought about telling you. I didn't see Dexter yet. I thought it was still on my Tvo but it isn't anymore. I'll see if I can find on youtube one of these days. Sherri, I'm missing on my blog... Drop by whenever you have a minute, ok?